It’s no secret Alaskan winters can be brutally cold, but that doesn’t mean you shouldn’t have a blast during them. 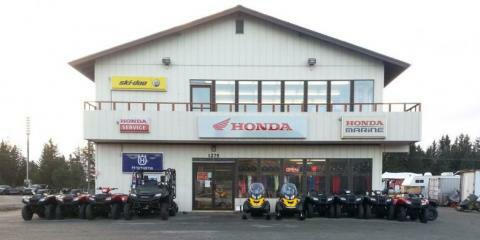 All Seasons Honda & Peninsula Ski-Doo, located in Homer, AK, is a locally owned ATV and snowmobile store that serves the communities of the Kenai Peninsula, including Anchorage and the Alaskan bush. While not the largest store, there’s nothing they care for more than their customers, which they’ve done for more than 30 years. Ski-Doo mountain sleds are what they do best at this snowmobile shop, with a wide selection of the best snowmobiles around. All Seasons orders new models every season, so you’ll always have access to the latest in sledding machinery. Looking for a top-of-the-line ATV for summer seasons? This winter vehicle store has the best ATVs Honda has to offer and can special order any Honda vehicle with a two-week turnaround. They also have Can-Am four wheelers and side-by-sides so you can even bring a friend along. Whether you’re looking for a rugged 4x4 or a 6x6, All Seasons has plenty of options for your off-road needs. Need more than ATVs and snowmobiles? Customers can shop for the best in outboards, generators and snow removal machines. Their wide selection of winter clothing will help you beat the winter chill, no matter what your task is for the day. Whether you’re looking for winter fun in a snowmobile or want to go off-roading during the beautiful summer months, All Seasons Honda & Peninsula Ski-Doo is the place for you. Call them today at 907-235-8532 or visit them online to view their gallery.